Varun & Rahul (my co-travellers) had been planning this road trip for quite some time. Frankly, i was sceptical till we drove out of Delhi. Such was the way, that hot May working week treated us. After scores of meetings & PowerPoint presentations, we were not in a condition to drive beyond the next metro pillar. But then, rebellious that we are, we decided to stick to our plan and started on a road trip with no destination, just 30 minutes before the Friday (18th May) ended. All we knew was, we had to climb the mountains and stay away from this hot, horrible climate of Delhi. Throughout the way, we discussed on our options between Landour (near Mussoorie) to Tehri with no conclusion. 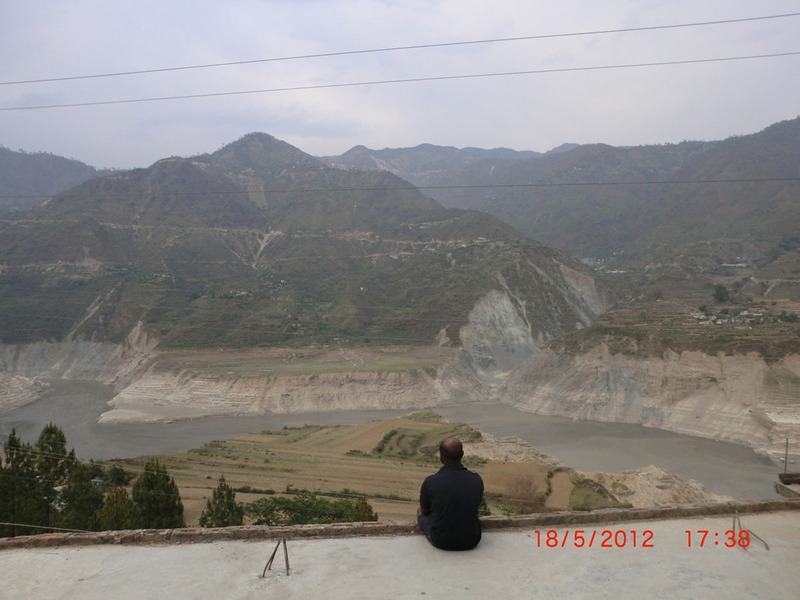 By the time we crossed Hrishikesh, we made up our mind for Tehri dam. New Tehri dam is in Uttarakhand state of India built on the mighty river Bhagirathi. Started in 1978, this dam took nearly 28 years to complete its first stage, swallowing an entire town (Old Tehri) in its making. We were lucky to see the tip of this, once densely populated, town in the centre of reservoir. Our trip uphill was not was not as smooth as we expected. We rode uphill with immense excitement to see one of the biggest dams in the World, right in the lap of Himalayas. 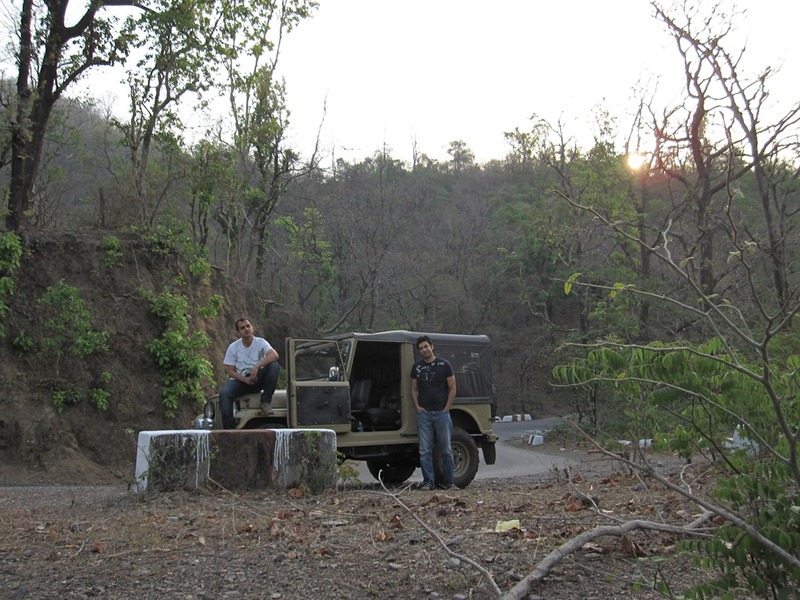 A 10 hour bumpy ride on ‘beast’ (that is what i call my vehicle), we reached Chamba by Saturday afternoon. Chamba is the crucial destination for any uphill journey to this side of Uttarakhand, especially if you need to visit the religiously important, trekkers heaven – Gangotri (one of the base for Gaumukh trek) and Yamunotri. You can also drive to Dehradun from here (an option for our next destination). While climbing uphill, ‘beast’ started over heating and her steering wheel ran at its will. A pit-stop at Chamba for an hour revealed some loose bolts in the wheel alignment. We still had the challenge of engine over heating. Tehri was just 20 kms (approximately) away and we decided to continue our journey. Our ‘map-man’, Varun, promptly guided us to Tehri where we conveniently ignored the ‘restricted entry’ boards and drove till the gate of Tehri dam project. A close view of the half-filled Tehri dam reservoir, under the blazing Sun, was a sight to remember. The sheer size of the reservoir cradled among the extended Himalayan range took our breath for a moment. 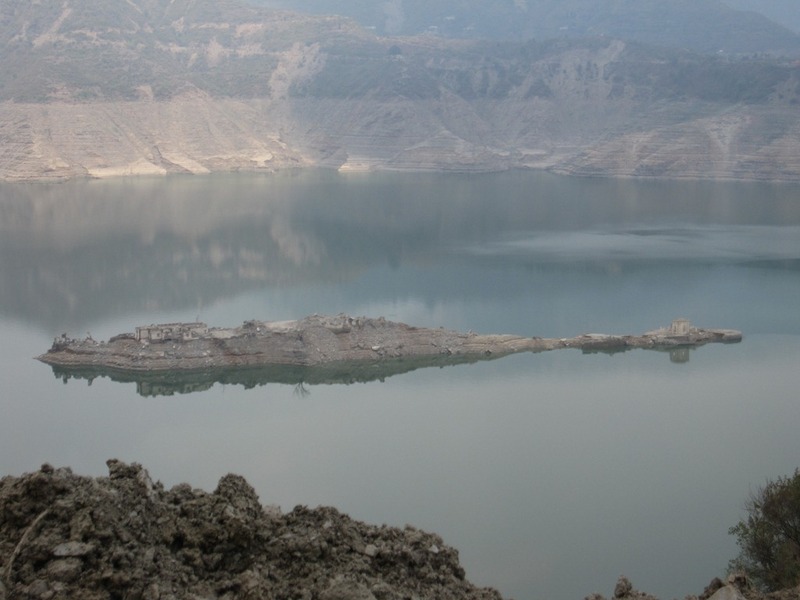 Thanks to the hot summer Sun which could vaporize anything in its way, we saw the tip of the submerged Old Tehri town. It was not a mesmerising sight, rather it was a depressing sight to see the lost town. Reminded me of the fact that nothing in this world is ours forever. We were tired, thirsty & hungry. The last meal which we had was when we took a two hour break at Narendra Nagar near Hrishikesh – one parantha and two ‘can-be-called’ tea each. Always remember, the “pahadi’s’” (a common term used for people who stays in the hilly areas of India) eat less of ‘masala’ (spices) in their food. The tea you get from the roadside vendors are yucky with very less milk and the sugar is more than what you might think of having in a month. So we decided to head back to Chamba for lunch (a sumptuous one we had!) then decide our future course of road trip. We had a very heavy Non-vegetarian meal at Hotel Gautam (co-ordinates: 30.345186,78.394792 ). 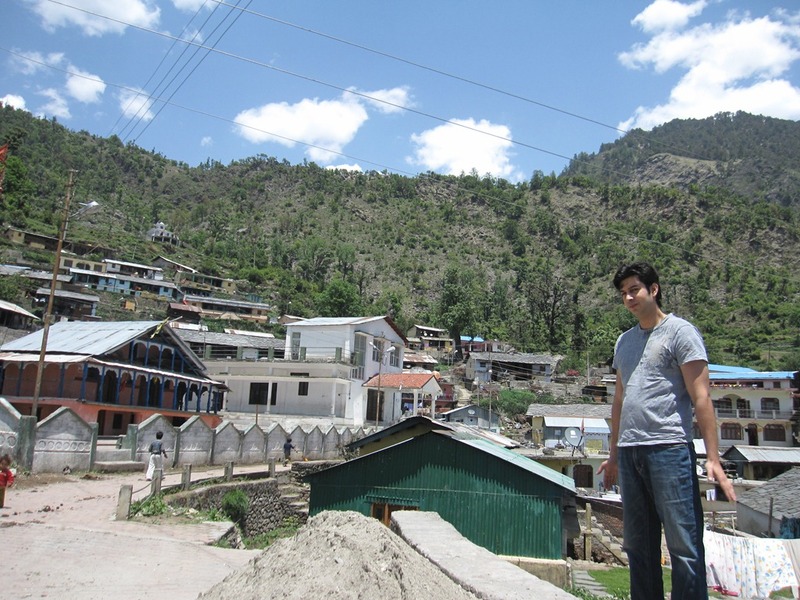 The head waiter at the hotel suggested us Uttarkashi – his words picturing the place as something next to heaven. We couldn’t resist the temptation and the ‘map-man’ quickly took his ‘berry the black’ smartphone to chart our way. Our next destination was 90 kms away, the most exciting part of the whole road trip. When we started our drive down hill, we never expected the grandness that awaited us – my latest crush, Bhagirathi. I feel shamed to say, i never knew Bhagirathi before. 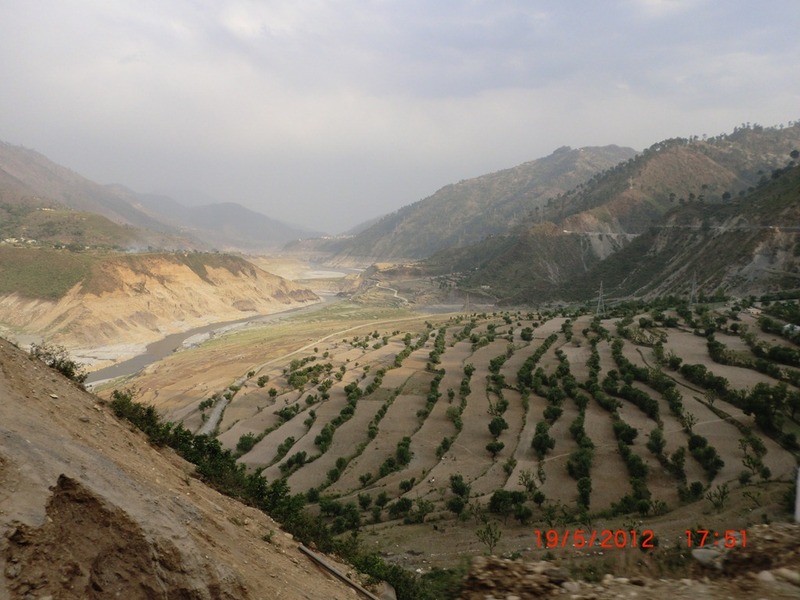 But the elegance of this mighty river who carved Her way through the mighty Himalayan mountains gave us Goosebumps. It was ‘love at first sight’ then and now it is a relationship forever. For those who do not know Bhagirathi like me: http://en.wikipedia.org/wiki/Bhagirathi_River. She is a mythological goddess from Gaumukh and truly a goddess in this horrible times. We drove up and down the great mountain range, side by side to this great river. She is drying up, the grandeur loosing day by day. But, Her mighty flow in yesteryear has left an everlasting impression on the great mountains by Her side. The carvings are mightier than any human could or had created. River beaches gleamed under the hot Sun, proudly remembering those foregone days of glory. Every inch of the river bank invited us to rest by Her side – listening to the music of Her flow. The stillness whispered us to forget everything that is today & to remember everything that we forgot from the past. We gave up to the temptation once in a while and rested. The beast too was tired and frequently heated up – till Rahul found a way to control her ‘hotness’ by reducing the rev and slowly climb the mountains in 3rd gear. There were forest fires every where on our way through the mountains. Mighty red flames glared at us, as if nature was glaring at us with all her vengeance against the destructive urban human race. I believe these fires are controlled ones, to prevent an uncontrolled forest fire, as it was summer and the trees & shrubs were all dry – ideal for a very destructive forest fire. Rahul & Varun still disagree with me. Its still a mystery but what possible explanation can be there for these sporadic fires across 100 kms of mountain range? We reached our destination by 8 P.M. on Saturday. Exhausted by the constant drive & lack of sleep, we checked into the first decent hotel by the banks. Uttarkashi is a holy stop for pilgrims heading to Gangotri. Road uphill to Gangotri is closed after sunset and opens only at dawn. Though its just 80 kms away, drive uphill to Gangotri is very tricky and dangerous with constant landslides & narrow roads with deep gorges on one side. Not to mention the heavy traffic of pilgrims who suffocate this route. 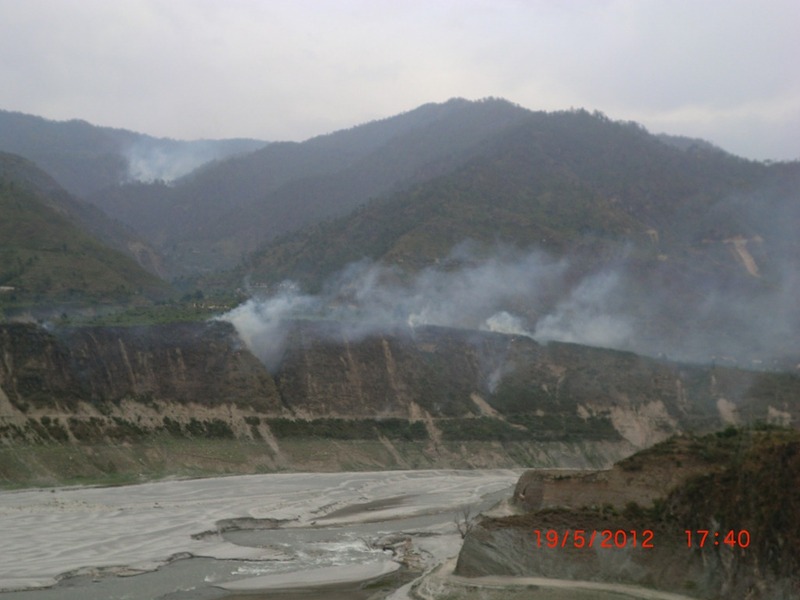 Uttarkashi is divided by Bhagirathi and surrounded by mountains. Thanks to the flocking pilgrims, this place is now a small town and quite dirty. We didn’t dare to venture into the town. 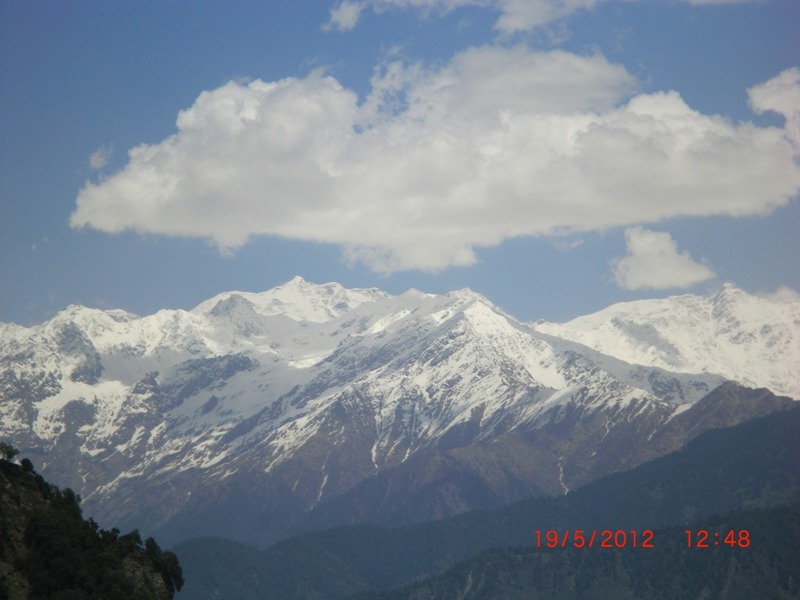 Uttarkashi is famous amongst serious mountaineers for the Nehru Institute of Mountaineering. We were blessed with a room overlooking Bhagirathi and the pilgrim traffic on the other side of the bank.After a few drinks and a sound sleep, first in two days, we woke up to a pleasant Sunday morning with a cold breeze. A quick bath & a small fight with the receptionist over the bill (he charged us for additional bed without intimating), we set towards Gangotri. Its then we realized that we had just a little over INR 500 in our pockets, collectively. We frantically searched for an ATM and found a PNB & SBI ATM – both of them without any cash, thanks to the weekend. Travellers in this region are recommended to carry some back-up cash for emergency like this. After a quick analysis of our situation (diesel status & monetary issues) we decided to head to Harsil. Harsil is a famous, less exploited, hill station in Uttarakhand. Its like Ranikhet or Lansdowne (other hill stations in Uttarakhand) with an army cantonment area. We had to cover 60 kms one way and we had diesel for less than 100 kms, inside beast’s belly. 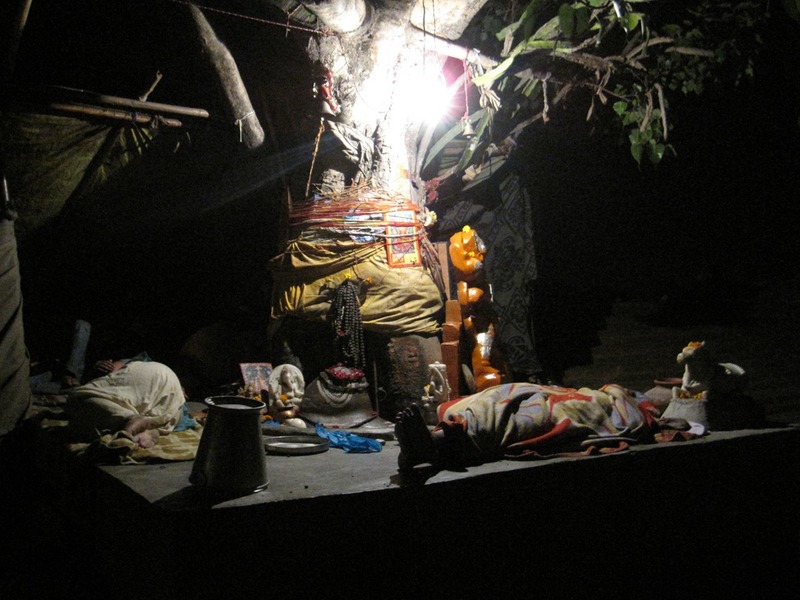 We prayed to all the Gods & Goddess in Himalaya’s, that we find a functional ATM on our way, but it was all in vain. After some 20 kms we were convinced that there are no ATM’s further uphill. It was almost noon when we reached Barsu. We were worried about our financials and didn’t want to spend too much time uphill. Considering that we need to fuel up ‘beast’, we hardly had any money to stay back in any hotel for the night. 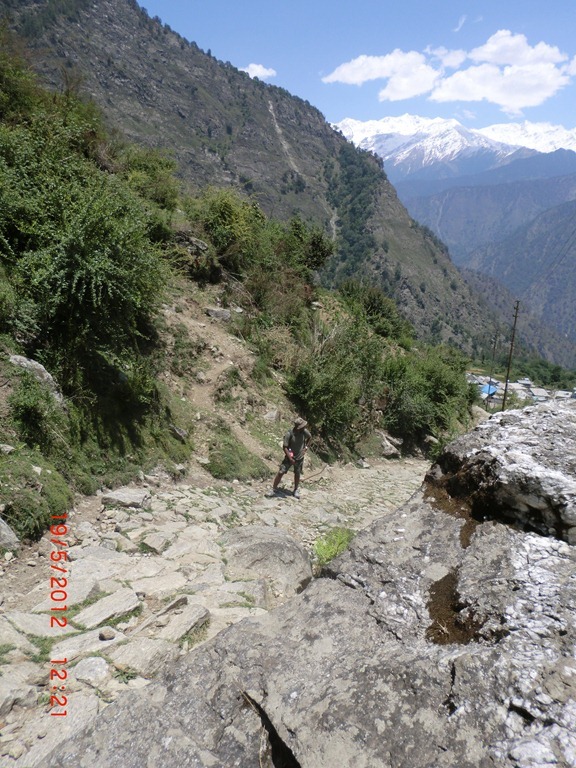 We decided to trek uphill for an hour and head back, so that we would be in Uttarkashi by evening. Suddenly, Varun opened the magic vault in his wallet and showed us two glazy Rs. 500 notes from his reserve cash. Rahul and me were wondering whether to through him downhill or give a bear hug. Nevertheless, we decided to stick onto our plan and trek for an hour. 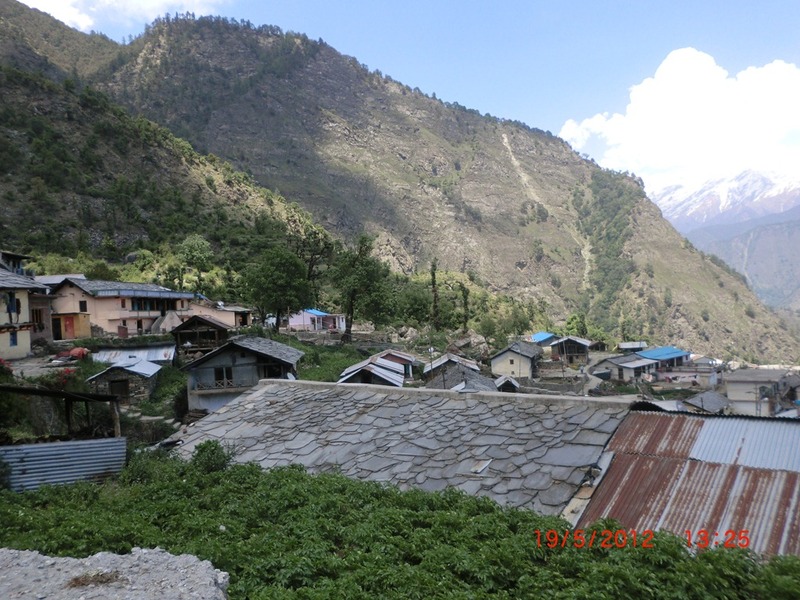 Barsu is a small village with a GMVN hotel (Garhwal Mandal Vikas Nigam Ltd – local tourist body) and some 50 odd houses. Calm & serene, this is an ideal get-away for the city dwellers. The village had a huge pond with concrete paved roads (too narrow to drive). Villagers here are very helpful and stopped by to give us directions, they even offered us tea & a place to keep our bags. Since we were running out of time, we politely declined the former and accepted the latter. Their attitude brought warmth & energy into our tired & hungry self. But it was not enough for us to climb uphill. Such was our condition after some 400 kms of ride and constant travel, like vagabonds. We almost ran out of breath after an hour of uphill trek. 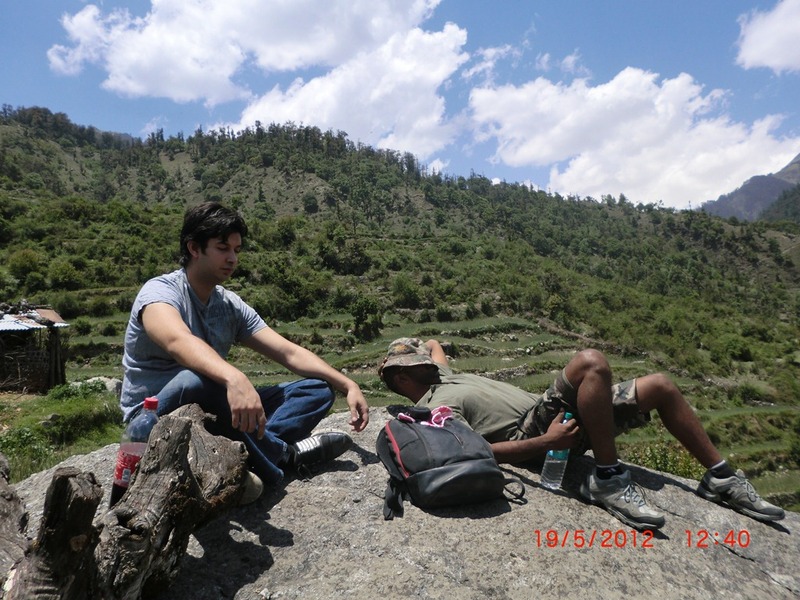 While resting under a tree, Rahul ventured into the terraced farms nearby and found a rock to rest. We followed him to stare at the snow clad mountains, so close yet so far. It was as if the mountains were at the edge of the wheat fields, a leap away. We rested on the rocks, enjoying very moment of the heavenly atmosphere. None of us talked; i was scared that i may wake up from a dream in the concrete jungle i call home. I so wished i could be there forever, but then who will finance my next trip to the great white mountains? We rode back straight to Delhi, spending some moments (on Sunday midnight) at Haridwar, by the Holy Ganga (Bhagirathi becomes Ganga at Devprayag, above Hrishikesh). The stinking water and the crowded ‘ghats’ (steps leading to the river). The stark difference in atmosphere made me realize that nature too is being raped by us, unfortunately there is no strict law to prevent this disaster. By 8 A.M. on Monday, we were back in Delhi. I promised myself that i will return again, this time, trailing Bhagirathi till Gaumukh, come whatever may. PS: Salutes to BRO (Border Roads Organization) for maintaining the road (NH 34)for the way it is, in spite of numerous landslides, some of which were just a couple of days old. Me too read it all and this is not a sarcastic comment. I enjoyed reading it too. thank you, but i need some serious criticism to develop my writing skills. in fact i too felt this was a lengthy post and should have broken it.